Big thick snowflakes, plopping wet on the ground in a slushy mix. It seems out of place on the palm tree fronds, out of place for the Middle East. On the grass, the inch or so of moist snow is perfect for snowballs and snowmen (but way too wet for snow angels), but the kids I’ve seen playing outside haven’t tried to make Frosty yet. It’s too warm for much accumulation, so it’ll be slushy, for the most part, today. We apologized for denying him a snow day. 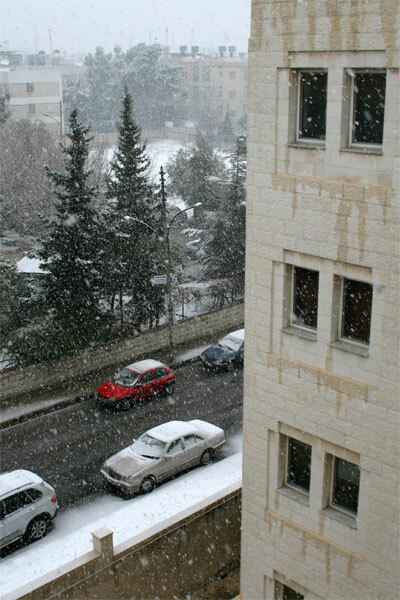 Five years ago, there was day when there was a meter of snow in Amman. It shut down the city for a couple of days. No snow plows. Lots of hills. Bad combination. Just stay home. I don’t mind the snow here so much. At least it’s warmer than it was a week ago, and Carolyn (the executive producer of the project I’m doing here) was finally able to convince the landlord at the apartment building to turn the heat on for more than four hours a day. It was so cold in my bedroom the other night, I checked into a hotel to sleep. Carolyn and I have both been very sick for the past week, struck by a nasty virus that has gripped half of all the folks we’ve been working with. I felt like a nurse in the tuberculosis ward. After two stressful weeks, our systems could fight it off no longer and we finally succumbed. At the tail end of my time in Beirut, I was down for the count, but now all I have are lingering sniffles and sneezes. Carolyn is still very much under the weather, and, understandably her mood is as blustery as the whirling snow outside. But in the edit suite I’m content, listening to the Arab House audio mix, and viewing the wintry mix through the window. Go home. Go home and take a snow day, Mrs. Braintree!